Between the time of the First World War and 1947 Taylor’s major line of business was Coach building. Taylors had always made wagons, trollys and tumbrils but in the 1920s they moved into buses and coaches and even rail cars. 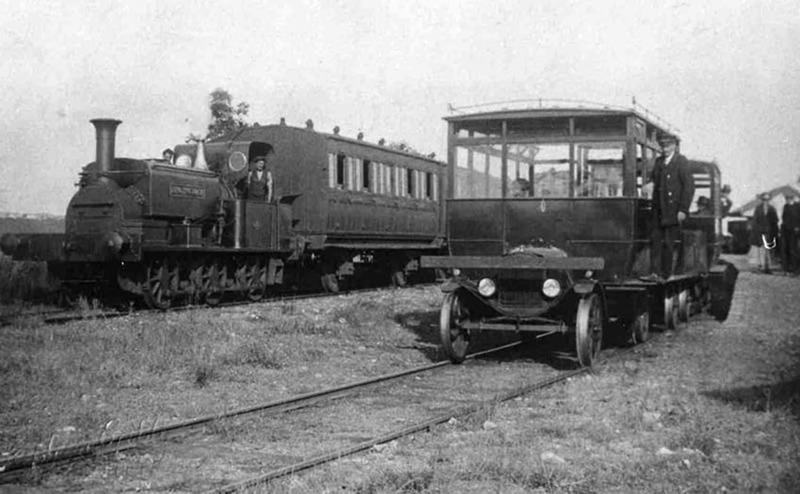 The rail cars were based on Ford-T chassis and ran on the Kent and Sussex Railway, the Shropshire and Montgomeryshire and the Selsey Tramway. The photo is taken at Selsey Station.as seen in the picture below. Were these the very first Commuter Trains? You can see a Pathe News film of this train by clicking on the link. Many of the chassis for the coaches were imported from America such as Reo’s, Studebaker and Cheverolets. They were better priced (more efficient volumes were made). They were driven to Norwich from Bristol or London Docks by a team of men, although I believe Studebakers chassis were assembled in London. They would deliver a completed vehicle to almost anywhere in the country including Scotland and Wales and then catch a train down to Bristol Docks or to any of the many chassis manufacturers in Britain. Mr Peter Taylor made several journeys as a young man and recalls some terrible moments in thick fog on unlit poor roads. According to Tom Turner, who worked for Taylors for much of the period between 1940 and 1960, and Peter Turner, his brother, the people who drove the chassis to Norwich had only the engine, bonnet, windscreen and a wooden seat. They wore leather helmets and goggles, stuffed paper inside their shirts and would cover their legs with old bits of tarpaulin. They would often arrive frozen. 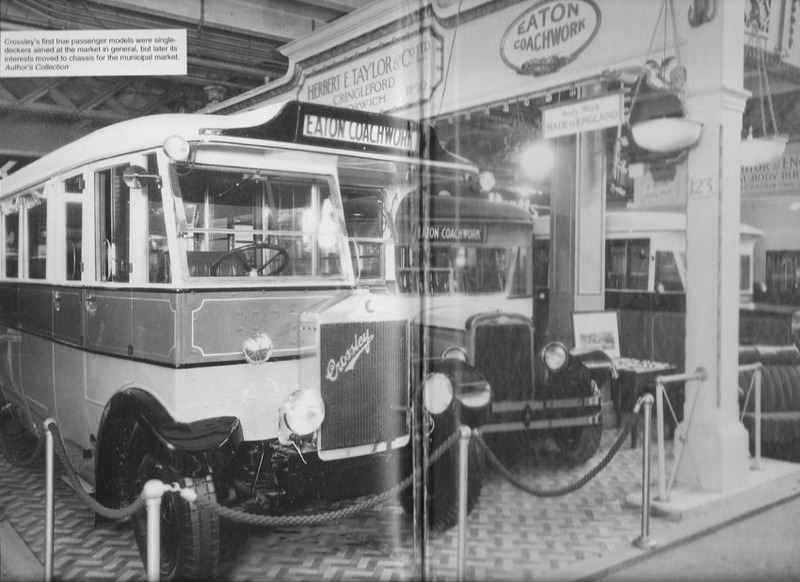 Before the Second World War Eaton Coachworks used to exhibit at the Bus and Coach Show at Olympia in London where they gained many of their sales. The photo above is taken out of a book, ‘British Buses before 1945’ with kind permission of the author John Aldridge. Unfortunately the original photo is lost. Eaton was the trade name under which H E Taylor & Co's coachwork is marketed and three examples of their passenger bodywork are displayed at this show in 1929. The farthest coach is a BAT Cruiser chassis and is fitted with a 22 seater semi-de-luxe saloon. The middle coach is a REO with a 22 seater all weather saloon body. The Crossley Eagle is the largest model with 25 seats. 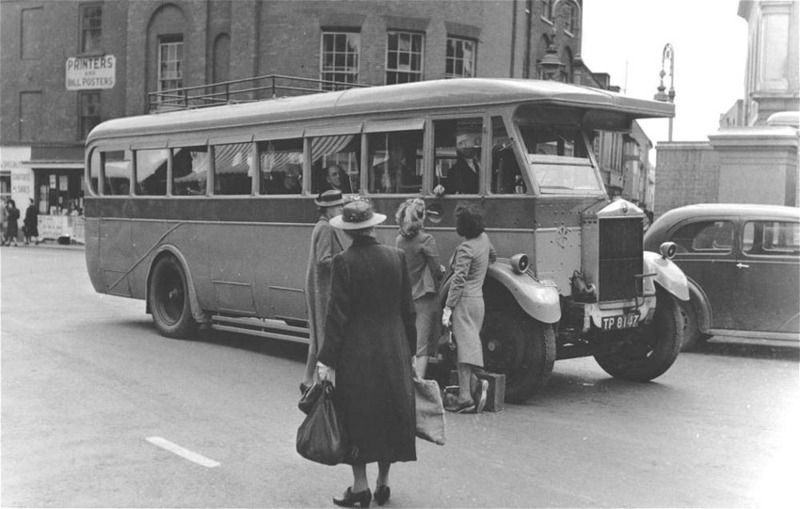 The BAT chassis coach was suitable for either long distance work or town-bus service. It is a one-man operated type and an emergency door is incorporated in the rear panel. The REO has a sliding roof and on the Crossley Eagle full advantage was made of the forward driving position and the low loading chassis to provide comfortable accommodation for the 23 passengers. Please see our Gallery that lists the many photos we have of coaches made by Eaton Coachworks. There are over 20 different makes of chassis and many different styles of coach body. Eaton Coachworks also continued to make other lorry bodies for farmers, removal firms and even a beautiful horse drawn dray for the Norwich Brewers, Steward and Patteson. This was frequently displayed at the Royal Norfolk Agricultural Show during the 1950’s and 60’s. If anyone reading this has photos that are not included then please make contact with me. Although Eaton Coachworks made all kinds of bodywork to order, the coaches were generally to a choice of specifications. The customer chose the make and model of chassis and the style of coach work to meet their specific requirements. We know of at least 25 chassis manufacturers used by the firm and could have been many more. Body styles included utilitarian buses, luxury coaches, all-weather coaches and ‘sunshine observation’ coaches. The coaches were fitted out in wood, mainly ash and oak frames and covered in sheet aluminium metal. Floors were made using best T & G yellow deal with under bearers and pillars being strengthened with steel flitch plates let in and bolted on where necessary. During the 1930's and 40's many coaches were fitted with sliding roofs and Widney Stuart half-drop windows with Rawlings fittings. More recent innovations included a front door hung on a continuous hinge that gave a large opening and a Leveroll adjustable seat for the driver. The coach building, in the sheds facing Intwood Road and known as ‘The Eaton Coachworks’, turned out about one coach each week, and these went all around the country to private operators, but also to many Corporations such as Wolverhampton who took delivery of four S M C Pathan 31 seater coaches. Taylor’s supplied coaches to local firms such as the Norwich Tramway Company which became Eastern Counties Omnibus Company in 1933. They ran a daily service between Norwich and London in a fleet of Daimler/Eaton Coachworks luxury coaches. Others local firms were Culling Coaches, Fitt Brothers on Ber Street (who we believe took delivery in the last coach made by Taylor’s in 1947), Humphreys of Forncett St Peter, Mascot Coaches of Mile Cross Norwich, Norvic Coaches, and Eastern Motorways. 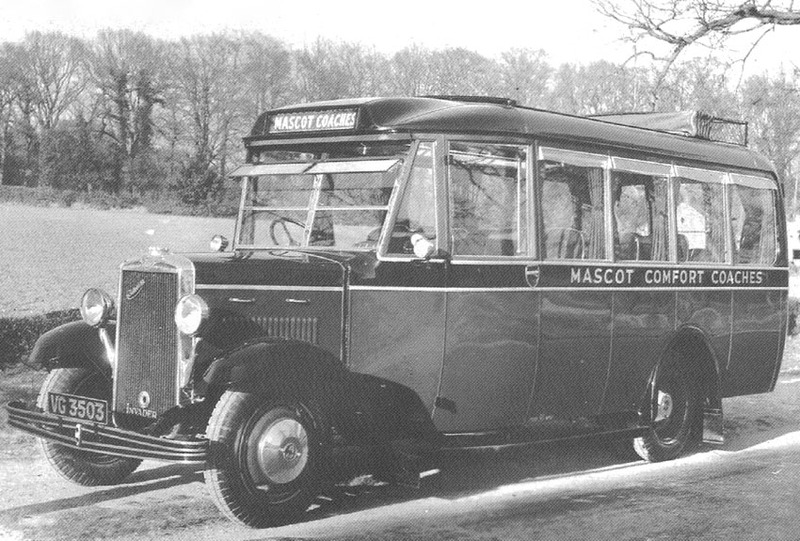 In 1931 Taylor’s supplied a 20 seater All-weather Sunsaloon Commer Invader Coach to Leonard Votier of Mascot Coaches in Norwich. The price was £797. Please see picture below. A Glasgow Company, Ferguson of Renfrew operated 22 Taylor bodied Gilfords, and many more were exported abroad. 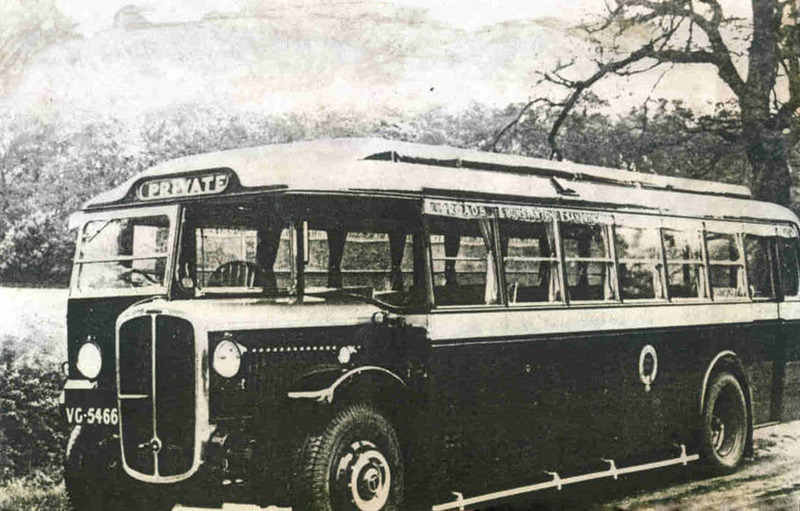 Some of the coaches had an electrically operated sliding roof and were used for sightseeing trips. There were many other local coachbuilders including Mann Egerton and Bush & Twiddy but I believe Taylor’s were at the quality and luxury end of coach building. Clearly doing business during the 1930’s was challenging and at times the firm held a stock of coaches/buses for immediate delivery. One advert states that DeLuxe Coaches on Gilford or Crossley chassis were ready for the road. Another offered a Crossley Eagle Bus fitted with ‘Eaton’ Service Bus Body painted in any chosen colour in 7 days. Eaton Coachworks versified into many other types of bodies during the 1930's and at the Commercial Motor Show in 1930 they displayed a car (probably Chevolet) that had a lift up hatchback rear door designed for the commercial traveller. Was this the first hatchback car ? An article from the Commercial Motor magazine with a photo and a description of this innovation is in the misc section of the Gallery Other vehicles produced were various vans, lorries for cattle, removal vehicles and during the WW2 they produced many Lomax Ambulances. The American chassis and many of the smaller UK manufacturers declined during the 1930’s as new Construction & Use Regulations dictated specific requirements for the British market. Eaton Coachworks made just about everything for the coaches including cutting the glazing required and making the upholstered seats. Many photographs of the different coaches made survive and these are listed in the Gallery section of this web site. A Crossley chassis coach purchased by Norfolk Motor Services Gt Yarmouth in 1929 and sold on to Cullings Coaches in 1941 and sadly scrapped in 1944. In 1936 Taylor’s had a competitor in a newly formed business of Eastern Coach Works at Lowestoft, although they had made buses for some years before. In 1947 Eastern Coachworks was nationalised and was increasingly taking business by producing all-metal buses which were more durable, lighter and cheaper. New methods of construction were inherited from the aircraft industry but Taylor’s were too embedded into the use of timber. Ike Mortimer (Coachbuilder until his retirement in the early 1950’s) commented that he thought that Herbert wouldn’t invest in higher workshops to enable construction of double decker’s. A Leyland Advert in 1938 declared that the new all metal construction buses and coaches were easier and cheaper to repair as damage was generally more localised. Taylor’s production soon ceased and the last coach was made in 1947 and was supplied to Fitt Bros of Norwich. After 1947 production continued on specialised bodies such as Cattle trucks and Removal lorries and the firm continued to carry out repairs and alterations. The main focus though was transferred into the high class joinery business. I have reproduced below many of the memories of Eddie Holden who was an Apprentice at Taylor’s before the War. The canteen was right at top of the firms yard next to the main road and part of this building was let out to war time shoe making, they turned out wooden soles and leather tops clog type shoes. During the war trees had to be dried out quickly for use so a drying hangar was put up and whole trees were put in there after being cut into slabs. The hangar was heated by waste wood, and a boiler with pipes all around the building. War time, most were for repairs, but we did turn out some new ones, in those days all wood frames, and Ali covered. We also made Ambulances, known as the Lomax Body work, all wood frames covered with Ali, two doors at the back, but were bowed inwards, more like stream lined, fitted out with two beds, but after a while the army wanted a more easy type so, the old army blood waggon came, just a square box thing yes it did its job, you have seen pictures of them, we built a few of them. This firm of H E TAYLOR turned out a lot of stuff for the war effort, like every other firms in the area at the time, like a little firm at Shotesham, an engineering firm, it made 250lb bombs or did something with them. Your Granddad was up there doing his bit, we had buses come down from London for repairs of war damage, they had to be repaired and back in service as quick as possible, but then my army time came, so till 1948, I cannot say what they did, but when I got back we made all new buses sorry coaches, up market ones, but then, the steel framed coaches were coming in so at the coach works it went in to a little decline, but it did more repair work, on the old wood frame coaches. Cockpits were made in the two workshops joinery and coach building shops, I do know Bristol Blenheim cockpits were made and M.O.D inspector checked everyone, and for the Defiant Boulton & Paul, never worked on them but I think they were built in the joinery shop, very different to the Blenheim. But we never put the Perspex on the cockpits, they went off and had that put on elsewhere. The Blenheim cockpits were quite big as the pilot, co-pilot and bomb aimer sat in it. Yes as youngsters we sat in them and yes we thought we were pilots. There were at least 10 to 15 men working in Shop number 2 as it was now on a war footing, Army Huts being built, and Duck Boards made and nailed together. At one time I was in that shop making Sledges, yes sledges, not for snow but for the jungle war-fare, these were big things about 8 to 10 feet long and about 6 feet wide, made of best Teak wood from Burma and yes going back there for Elephants to pull these through the jungle, how’s that for history, and yes I caught up with these again later in the War when I was in then French Indo China, now Cambodia. Arthur Spratt had to design a machine to cut strips of camouflage to a certain length, for netting to go over tanks and guns, these strips were to be woven into the netting, yes he did it and the army ordered them. On the outside of Shop 2 was a big pool built for Creosote for ducking in the Duck Boards to weather proof them. H.E.TAYLORS (Cringleford) was one of the largest firms of employers in the area, you had the Wood Mill where all trees came in from around the countryside and cut into slabs and stacked with pieces of wood between them to let the air dry them out. The drugging tractors were of four wheel drive, and they turned their wheels to steer them back and front, they could as we say turn on a sixpence, and the trailers that brought the trees on were just four wheels with a steel girder in the middle to hold the wheels apart, they could be extended to suit the length of the trees. Big band saws cut them up, yes there was a saw doctor, that's his title, he repaired the saws when broken and sharpened them. Every type of tree you could name was in that yard. Next the machine shop where all the wood was planed and lathed turned, and all sorts of different groves and features spindle onto them; then the joinery shop, coffin making and everything else was made there, furniture, you name it they made it, then you had the boiler house, that burnt all the off-cuts of wood and shavings so the shops were all clean and tidy of this mess. That was a full time job for the boiler man to keep every shop clean and tidy of rubbish, and in winter all shops were heated from the boiler room. Men worked in warm conditions in winter. Next you had the upholstery shop where all the coach seats were made and covered with what the customer wanted, colour and material. Then the blacksmith shop, yes spent many hours there putting tyres on waggon wheels and in the middle of the yard was a little hut, that was, so I was told, where Taylors first started, and Herbert would not pull it down. It was really in the way of traffic go up the yard and coming down, but it stayed. Next at the bottom was the office block, God’s Palace nick-named, then the garage and stores and clocking-in clock.? Going up the yard on the left was the two coach shops. You must remember in those days the boss was the boss, but having said that, your Granddad was underneath a kindly gentleman as I will tell you of some of things us young lads got up to and got caught by him. I suppose he did employ about 150 men at that time doing all sorts of jobs, the building workers that worked we never knew how many of them, and the people cutting down trees and drugging the trees to the works, plus taxi drivers and lorry drivers, yes it was a mad dash to clock-in on the mornings, big queues all waiting at once, great days.